Chuck Mcdowell from ESOEBO hosts the EOP Writer Series. Joining Chuck for the March 29th, 2019 show is Tommy Womack, Ed Heinzelman, and Lane Denton. Tommy has released seven solo albums, the latest being the brand-new "Namaste". Eddie Heinzelman has made a major footprint on the country music landscape as an in-demand session musician/sideman. Layne Denton is one of Atlanta's fastest-rising stars in the city's historic singer-songwriter community. 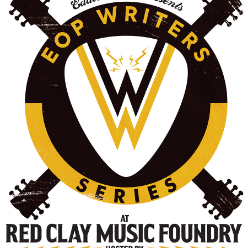 EOP Writers Series: Chuck McDowell with Tommy Womack, Ed Heinzelman, and Layne Denton SAT, April 20th at 8 pm Live at Red Clay Music Foundry Tickets: https://www.etix.com/ticket/servlet/s/38176536 GA: $20 ADV/$25 DOS Chuck Mcdowell from ESOEBO hosts the EOP Writer Series. Joining Chuck for the March 29th, 2019 show is Tommy Womack, Ed Heinzelman, and Lane Denton. Tommy has released seven solo albums, the latest being the brand-new "Namaste". Eddie Heinzelman has made a major footprint on the country music landscape as an in-demand session musician/sideman. Layne Denton is one of Atlanta's fastest-rising stars in the city's historic singer-songwriter community.